Families and outdoor enthusiasts will find no better way to experience nature and proximity to adventure than by staying in an RV, travel trailer, or tent in one of the nearby Grand Teton Wyoming Campgrounds. In addition to nearby Grand Teton National Park, basic National Forest, and primitive wilderness campsites, you'll find that Grand Teton Wyoming Camping is easy at these RV parks and private campgrounds. 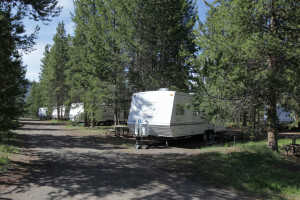 Enjoy amenities like electric hook-ups, showers, laundry, sewage dumps, great location, and much more on these well kept properties in Grand Teton National Park. 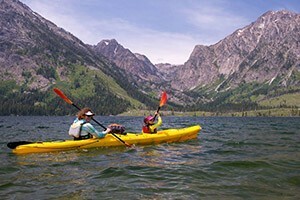 Quick getaways in Grand Teton National Park featuring guided kayaking, hiking, rafting and one-of-a-kind catered camping on a pristine Grassy Island. OARS, since 1969. 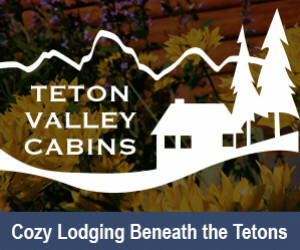 Just 2 miles from Yellowstone Park's South Gate, find cabins, camper cabins, RV sites & tent camping conveniently near Yellowstone Park, Grand Teton Park & Jackson Hole. This riverfront campground offers RV sites, tent sites, and kamping cabins, as well as many amenities including a pool, game room, fishing, laundry, and wifi. Lodge rooms, western cabins, RV park and campground located along the scenic Togwotee Trail on a former longhorn cattle ranch in Dubois, roughly 1 hour to Grand Teton Park.